Can a Dental Implant Look Natural in a Smile? Are you missing teeth in the front and thinking about a dental implant to replace it? If so, are you concerned that the new tooth might not look as natural as your other teeth? If so, then read on and see how terrific Tim’s smile looks with a dental implant and 2 crowns done in our Charlotte dentist office. When Tim first came to see us, he was worried about a front tooth that had suddenly become loose and dropped down. The tooth had a root canal and crown down nearly 35 years ago (pretty impressive! ), but unfortunately, the root of the tooth itself had fractured below the bone and could not be fixed, so we ended up extracting it. Because the crowns were so old and didn’t match his other teeth, we decided to redo the one next to it so his smile would match. 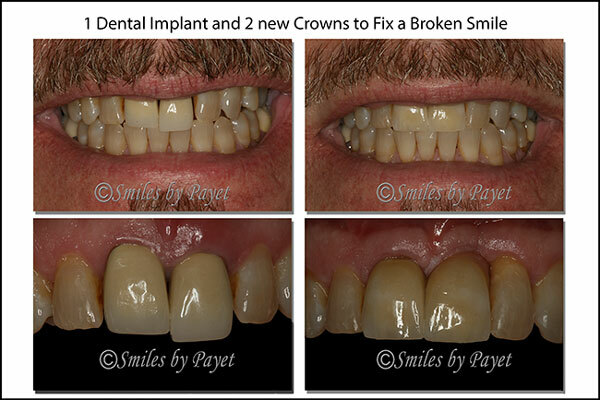 When doing dental crowns on front teeth or implants, it automatically becomes a cosmetic dentistry case, so we have to work with a really excellent dental laboratory to create an artistic smile, especially in a case like Tim’s. If Tim had wanted to do porcelain veneers for his whole smile, this would have been a lot easier, but he was otherwise happy with his smile. Because he didn’t want to do Deep BleachingTM to brighten up his whole smile, and anything else really wouldn’t have worked on his dark teeth, we didn’t try to use our same day Cerec crown system here. Here at Smiles by Payet Dentistry, we only work with excellent labs, so you can be confident we’ll give you a completely natural look, we promise! And if you look at the Before and After Photos below, we think you can see what we mean! Even though it can be very hard to make crowns match teeth, a skilled cosmetic dentist working with a skilled lab can make it predictable and “look” easy. Need an Experienced Charlotte Cosmetic Dentist? Call us! Conveniently located near the intersection of Park Rd. and Woodlawn Rd., we are only minutes from Uptown Charlotte or from south Charlotte, easily reached from I-77. With years of experience and training in cosmetic dentistry, we offer Charlotte residents a full range of options in improving your smile.